Aly Dosdall: Happy National Digital Scrapbooking Day!!!! Happy National Digital Scrapbooking Day!!!! So my hubby always rolls his eyes and laughs when I tell him what today is. He says, "Who decides this??" He just doens't get it, bless his heart. =) Anyway, I LOVE that there is a day set aside to celebrate this amazing hobby and art, and I want to celebrate it with YOU! There's a huge party going on over at DigiScrap 101 today, and you're invited. 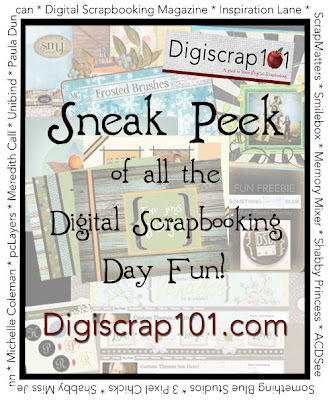 All you have to do is go over to the site, register, and then add the friend "National Digital Scrapbooking Day". This "friend" looks like this: Then go to your new friend's profile, and you will find freebies and gift certificate give-aways all day long every hour or two. Some of the leading designers and sites have donated goodies you won't want to pass up. Here's a little preview of the goods you can pick up today: HAVE A GREAT DAY! !